There once was a turtle who could not stop talking. He talked to his friends. He talked to strangers. Turtle talked to everyone. He talked in the morning. One day Turtle talked to two geese that lived far away. "You should visit our home," the geese told Turtle. "We live on a beautiful lake, surrounded by beautiful mountains." "I wish I could go with you," said Turtle. "I would like to see your home. It would give me more to talk about. But, I cannot fly." "We can carry you," said the geese. "But, you must promise to keep your mouth closed and not say a word. Can you stop talking long enough to travel a long way?" "Certainly, I can keep my mouth shut," said Turtle. I am very good about being quiet." This was not true. Turtle could not stop talking. But, the geese did not know turtle well like his friends did. The next day the geese came back carrying a big stick. "You bite the stick and hold it in your mouth. We will hold it with our feet while we fly. Do not say a word, or you will fall to the ground." "I can keep my mouth shut," the Turtle said again. He bit down tightly on the middle of the stick. The two geese took hold of the stick and flapped their wings. Soon they were flying high above the ground. The Turtle held on tightly. Turtle wanted to say how small everything looked. But, he did not open his mouth. The geese passed over the village where Turtle lived. Turtle wanted to shout and tell everyone that he was going on a long trip. But, he did not open his mouth to speak. "Look at the flying Turtle," shouted the children below. "He looks like the Turtle from our village." "That cannot be our Turtle," said a little boy. 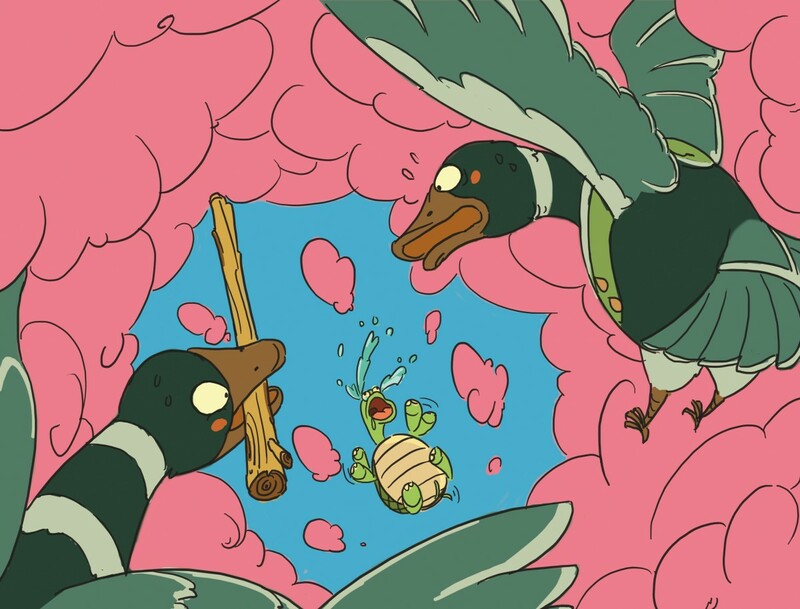 "Our Turtle cannot stop talking long enough to hold onto a stick in order to fly through the air." "I can too stop talking," said Turtle. But, as he opened his mouth to talk, he let go of the stick. Turtle fell back to the earth. He landed in the mud next to a river. The children came running to see if Turtle was hurt. But, they could not find Turtle. He knew that he had talked when he should have stayed quiet. Turtle dug into the mud and slept all winter. Turtle did not come out until spring. When the children saw Turtle again, he had cracks all over his shell. They also found that Turtle no longer talked all of the time. Turtle finally learned how to be quiet.